In a near-impossible race against time, Tobey Marshall (Aaron Paul) sets out on a mission of revenge - but it proves to be one of loyalty and redemption. Hitting the road with the world's most exotic supercars that deliver real speed, real danger and real grit, Tobey pushes his limits to the max - no matter what the odds are. 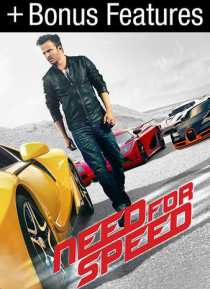 Adapted from the top-selling video game franchise - Need For Speed is an… action-packed thrill ride.